Only a few pink sand beaches dot the globe, and the rarity of these beaches add to the allure that they hold. Both their scarceness and their beauty make the world’s pink sands beaches astoundingly attractive tourist destinations. Here are the best pink sand beach vacation ideas around the world, including Bermuda, Greece, Italy, Maui, California and the Bahamas. Horseshoe Bay Beach in Bermuda, which gets its name from its horseshoe shape, is a popular beach paradise that features a beautiful curve of light pink sand running into the beautiful blue waters of the Atlantic Ocean. The Bay offers a good opportunity for snorkeling, but it is only recommended for strong swimmers due to occasionally rough water. The beach is a popular cruise ship port, so it is seasonally quite crowded. However, if you visit during the off-season it can be a quiet and relaxing place to enjoy a day at the beach. Several other beaches are located nearby, as are hiking trails. 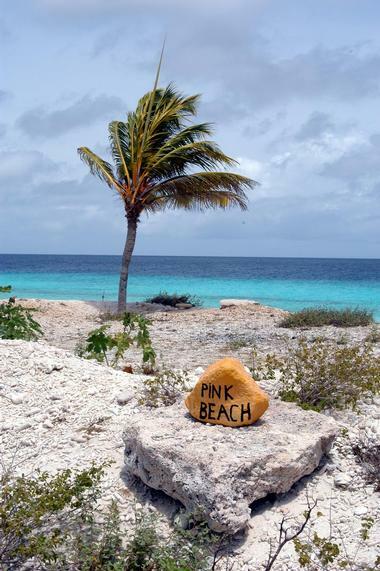 Bonaire Pink Beach is a narrow strip of sand located on the Dutch Caribbean Island of Bonaire. 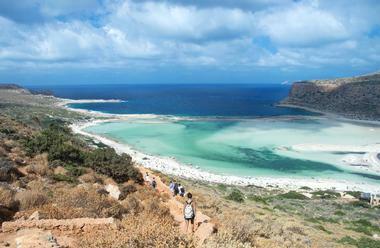 It is situated on the west coast of the island where the water is clear and the wind is calm. The beach is pink due to the presence of millions and millions of tiny crushed shells. The water nearby is an ideal location for snorkeling or scuba diving as the calm seas make for good, clear water conditions. The beach is a great place to relax and have a picnic, and it is a good location for sunning. A few palms line the upper section of the beach, providing a bit of shade. Balos is famous for its beautiful beaches, clear turquoise water, and breathtaking scenery. The beach can get quite crowded with visitors in the summer. The beaches are primarily white sand but are pink in some places due to tons of crushed seashells that have washed ashore. You can access the beach by either driving the 10 km dirt road or taking a ferry from the mainland. Adventurous visitors can also trek in from Kaliviani, which takes about 3 hours. 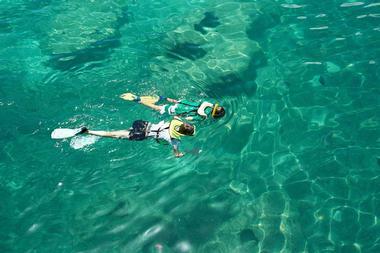 The water is very shallow and calm, but if you go a little bit farther out there is a good opportunity for snorkeling. Sea turtles and monk seals can sometimes be spotted in the area. Great Santa Cruz Island is a small island in the southern Philippines. The color of the sand comes from small crushed up red organ pipe coral that has washed ashore and mixed with white sand. Transport to the island involves taking a 15-20 minute motor boat trip from Paseo Del Mar. Komodo Island is one of the islands that make up Komodo National Park in Indonesia. 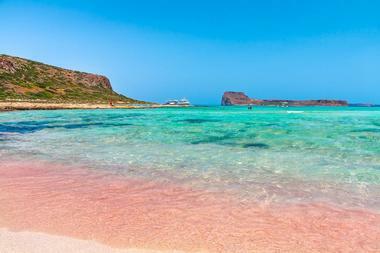 The island’s Pink Beach features stunningly pink sand on a backdrop of perfect scenery. The Pink Beach is heaven for snorkelers and scuba divers, as its coral is in very good condition. The water is shallow so it is a good place for people who are just learning to dive or snorkel. 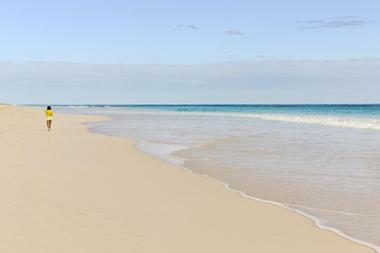 Pink Sand Beach in the Bahamas is a 3-mile stretch of pale pink sand and gentle seas. A coral reef provides a sort of break-wall for the beach, and the water is warm year-round, making it perfect for swimming. There are several elegant resorts as well as more rustic accommodation options nearby. The coral reef and calm water mean conditions are good for snorkeling. Fishing is a popular activity here as well. For those who want to venture into town, shopping at straw markets or going on a self-led walking tour can be a nice way to spend a few hours. This is the best pink sand beach in the Bahamas. Barbuda is an island in the Caribbean Sea which has not yet been over-run by tourists. 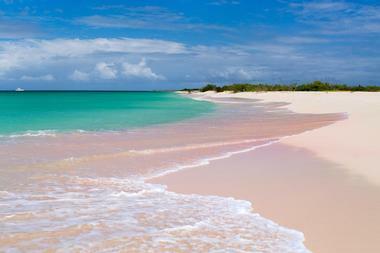 The beaches of Barbuda are very long and have sections of pink sand. The Atlantic side of the island has rougher beaches but the Caribbean side offers calm, turquoise sea and beautiful clear beaches. The waters offer the perfect locale to enjoy some snorkeling or swimming. There is an array of marine wildlife which can be seen under-water including sea turtles, sharks, rays and more. The island doesn’t have much in the way of tourist infrastructure but it is the perfect destination if you are searching for a laid back, relaxed beach vacation. Spiaggia Rosa is in North-East Sardinia, Italy on the tiny, uninhabited island of Budelli. The beach has a pink tinge due to shells and fragments of red coral. It is located inside of the La Maddalena National Park. Unfortunately, too many tourists were taking sand away from the beach, so it has been closed to tourists, however you can still view the beach from aboard a boat or from Spiaggia del Cavaliere nearby, which you can visit on a guided tour. Dolphins frequent the waters near the beach, and visitors who take boat tours to see the pink sands often see them. 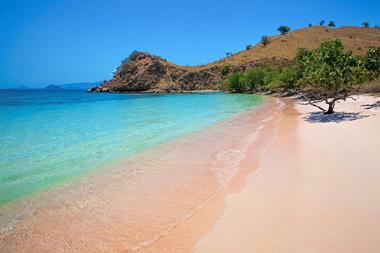 Lombok is a beautiful island in Indonesia that is home to Tangsi Beach, a scenic pink-sand beach. This part of the island is not yet incredibly well-known to tourists, and it therefore offers a tranquil escape albeit a bit difficult to get to. 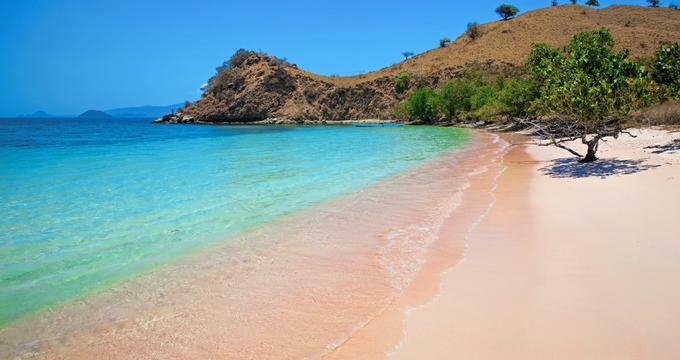 The famous, pink beach is located near a fishing village on the eastern side of the island. The water is safe and calm, so it is a popular location to swim and snorkel. Tangsi is surrounded by cliffs and hills, which make it quite a scenic location. Visitors can climb a nearby cliff and enjoy the view of the beach and sea. If you feel like exploring, there are several small islands nearby that you can visit by boat from Tangsi. Pfeiffer Beach is located inside Pfeiffer State Park in Big Sur California. The beach has unique, purple sand that is washed off of the impressive rock formations that line the beach. The purple tint of the sand is not always visible, though it is most obvious right after a rain. The surf is very rough, and it is often windy so it is not safe for swimming. However, visitors can scramble up the rock formations nearby, so bring good, sturdy shoes. There are also sea caves nearby through which you can watch the waves. The park and beach are both dog friendly. 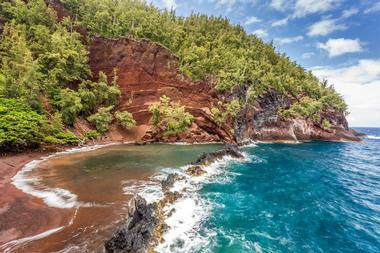 Red Sand Beach is a hidden beach that on Maui, while a bit difficult to get to, offers an almost other-worldly view. The red sand on the beach is caused by the nearby red lava cinder cliffs eroding onto the shore. The water is a deep blue color, providing an impressive contrast. To get to the beach, visitors must hike a somewhat dangerous and slippery trail along a cliffs edge. The visit is recommended only for experienced hikers. The beach is a great place for birdwatching and is also a popular beach with nudists and local eccentrics.